We’re a mixture of 3 parts Liverpool (Dom, Ted and Mikey), and 1 part Bolton. The Bolton bit would be Ed! Apart from Ed we all went to the same college years ago and went our separate ways after. Me (Dom) and Ted had been mates for years and years though. We met Ed through a mutual friend, Cameron (Lotus Eater). The band really started to take shape and come together about 18 months ago. A lot of that time was spent writing and recording the EP and getting our live show on point. Seems like we’ve been sitting on it for ages! Before you get sick of being asked, where does the band name come from? We tried to make a cool story about the band name but didn’t succeed. 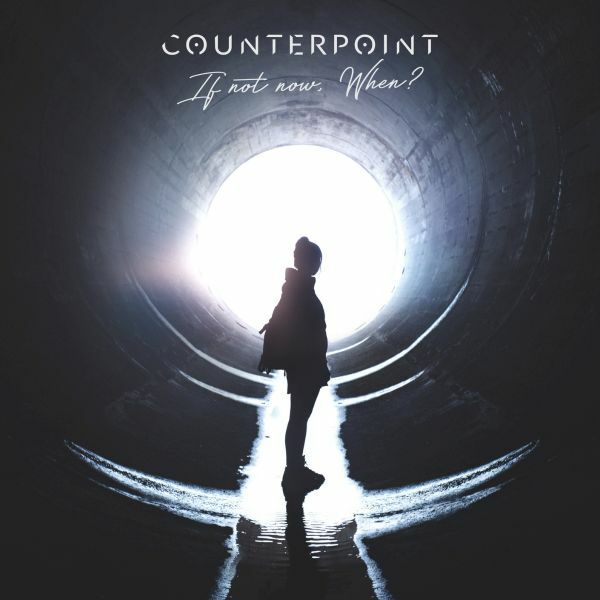 We’d been throwing names round for such a long time and Counterpoint was one of them. We thought it sounded ok and stuck with it. Now it’s who we are! There’s so many! Like honestly. We all have such eclectic tastes in music. From pop to metal and everything in between. We recently ran a series of posts over on our Facebook page of many songs that have influenced us over the years including bands like Alexisonfire, Thrice and Underoath. Those bands were just the tip of the iceberg. We could have ran with that for a year easily. We don’t set out to make something in a particular genre or feel, we write to please ourselves. And if we like it then surely others are going to like it, right? This way we have an EP with five tracks that are different but still identifiable. We’re all really into our late 90s metal vibe and it really comes across in the EP, not enough bands are doing that particular sound anymore. I try to approach negative subjects and leave a sense of hope about them in the song, they’re all written from personal experience and I hope anyone struggling with the issues I was, will find some element of validation, we’re not alone. As a band we’re in double figures but as individuals it’s easily into its hundreds, all coming from different fairly successful bands into Counterpoint. We made a conscious effort of keeping the live shows to a minimum whilst we concentrated on the writing and recording. As far as our live show goes we’re constantly trying to evolve it, tweak the set list, add lighting elements, etc. There’s always something to improve on. We have a move called BeyBlading where T will get on the Dom’s shoulders and Dom will spin round that usually prompts some action from the venue manager! We use probably the two most classic guitars ever made: a Les Paul and a Fender Telecaster. Honestly no matter what genre you’re playing, a Tele can make it sound better. Our debut EP If Not Now, When? is set for release 9th Feb 2018 and it’s 5 tracks of pure passion, energy, riffs, breakdowns, chugs, and sing-a-longs. We go off on tour in March and again at the end of Summer! Then we have a few more secret releases due this year too! It’s going to be such an exciting year for us. We’ve played with some absolutely fantastic bands, but hands down if I’m plugging anyone for you to check out it’s our mates Death Blooms and Citadels. Two bands from the northwest that are gonna smash 2018/19 and 20. Believe me. We would love to support Papa Roach or Billy Talent. From previous Band of the Day Saccage: How did you start creating music and why? My dad bought me a guitar when I was 12 which I messed about with for a bit, but when I was 14 I heard Limp Bizkit and I wanted to play what Wes Borland was playing, so my dad went out and got me a distortion pedal. My life changed! From another BotD, Hey Charlie: What is your dream venue to play? Sadly, it was the Astoria! But probably Ally Pally now, however if some fool wants us to come sell out Wembley Stadium then we are there! And from Huxtable: What is your favourite TV show theme?